Audi has revealed the all-new compact 2014 A3 Sedan, ahead of the 2013 New York International Auto Show. The dynamic four-door car offers all of the strengths of the A3 model series – with low weight thanks to lightweight design, powerful and highly efficient engines and numerous high-end solutions for infotainment as well as driver assistance systems. 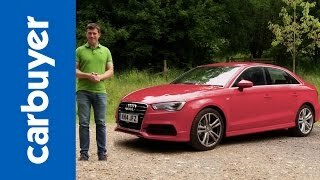 The Audi A3 Sedan has a sporty stance on the road. The four-door car expresses independent lines in the contour of its hood, in the bumpers, air intakes and its implementation of the single frame grille. At the rear, the spoiler is integrated in the trunk lid. LED technology is available as an option. Audi will also be offering full-LED headlights right at market. The interior of the Audi A3 Sedan is characterized by impressive attention to detail. It includes the slender instrument panel, the optional color display of the driver information system (DIS) shows images in highly detailed 3D graphics, MMI Radio system, electromechanical parking brake and sport seats. 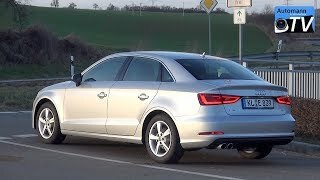 When the Audi A3 Sedan launches in Germany and Europe, the engine line-up will consist of three four-cylinder engines. The 2.0 TDI produces 110 kW (150 hp) and develops 320 Nm (236.02 lb-ft) of torque. 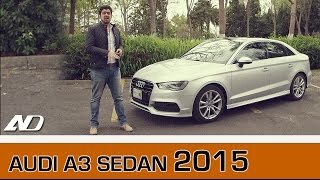 It accelerates the A3 Sedan from 0 to 100 km/h (62.14 mph) in 8.7 seconds and takes it to a top speed of 220 km/h (136.70 mph). The 1.4 TFSI produces 103 kW (140 hp) and 250 Nm (184.39 lb-ft). It takes just 8.4 seconds to accelerate from 0 to 100 km/h (62.14 mph), and the car’s top speed with this engine is 213 km/h (132.35 mph). The 1.8 TFSI produces 132 kW (180 hp) and 250 Nm (184.39 lb-ft) of torque. It enables sporty performance, taking 7.3 seconds for the standard sprint to 100 km/h (62.14 mph) and reaching a top speed of 235 km/h (146.02 mph).